New uNmINeD development snapshot is available for download! Thanks for all the work you’ve done on this since MC 1.13 came out. I’m testing the 0.12.10-dev Windows GUI version and it looks great so far. One thing I see is several large squares of my map that appear blank with red circles in the middle of each of those squares. It did this in previous releases as well. Is that a known issue? The most common cause of the red circle is a chunk from an older Minecraft version. You can convert all chunks of your world to the latest version using Edit => Optimize World in Minecraft. Change the –world parameter to the path of your Minecraft world. Change the –output parameter to the output folder (should be an empty folder). Any advice on where to find the path of my Minecraft World, or where to put (or find) my output folder? 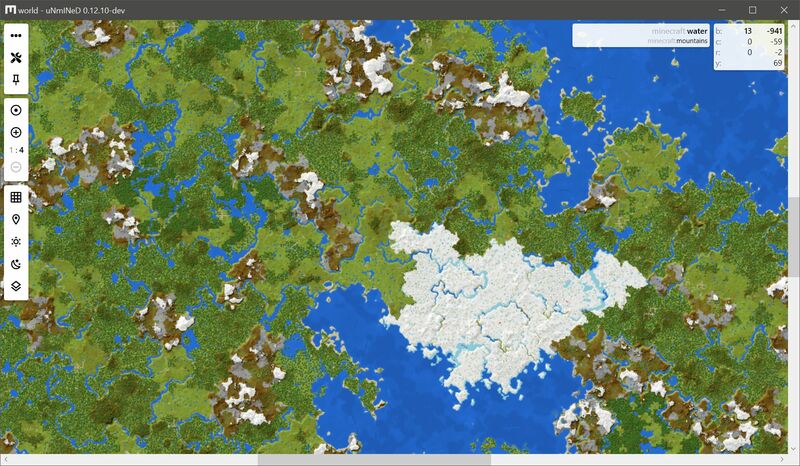 Select your world in Minecraft, then press Edit and Open World Folder buttons. A folder window will open, the path will be shown on the toolbar. Right click on it, and select Copy address to copy it to clipboard. You can create the output folder anywhere you want (e.g. on your desktop). Just curious if this verison of unmined has underground or xray view on the cli? I don’t see any parameters on linux that would suggest it’s active, but recent screenshots imply it’s still there. We’re loving it on our home server, thanks for keeping things up to date! Next releases of the CLI will work with configuration files where you can turn on xray and many other options. When using the splice feature you see the selected Y level AND all Y levels below it. Is this intended? Is there a way to disable this if it’s working as intended? It kind of defeats the purpose of seeing a single y layer when you see things that might belong to the layers below. I love this program, being able to do that would make it just that much more cooler. Thanks! On the slicer toolbar you can specify the lower (on the left) and the upper (on the right) Y levels to render. uNmINeD renders one Y layer when the two values are the same. However, the lower Y setting is currently ignored. It will work in the next release. Just checked back to see you’ve got things working in 1.13+ now 🙂 Just tried downloading it, but can’t seem to figure out how to export a png image of the map- is that a feature that’s still being worked on for the GUI version? Hi, the image export is still being worked on.